Absolutely the last of the snow tracks – tentative stoat tracks! The weekend before last I went out into the snow, and amongst the tracks were a set that puzzled me. The gait was very like a rabbit or a squirrel – a bounding gait with all four paws together in a group. The size as very small though – bigger than a mouse (and a mouse wouldn’t bound) and yet much smaller than a rabbit or even a squirrel. I have been consulting the guidebooks and I think I have a suspect. Bang and Dahlstrom’s Animal Tracks and Signs has this to say about stoat tracks “Walking prints are very rare, as they move exclusively by jumping. On reasonably hard ground, such as solid snow, the tracks in jump groups may be four and four, often similar to a small hare.” The Hamlyn Guide to Animal Tracks, Trails and Signs, adds that the stride length for a bounding stoat is typically 30cm. 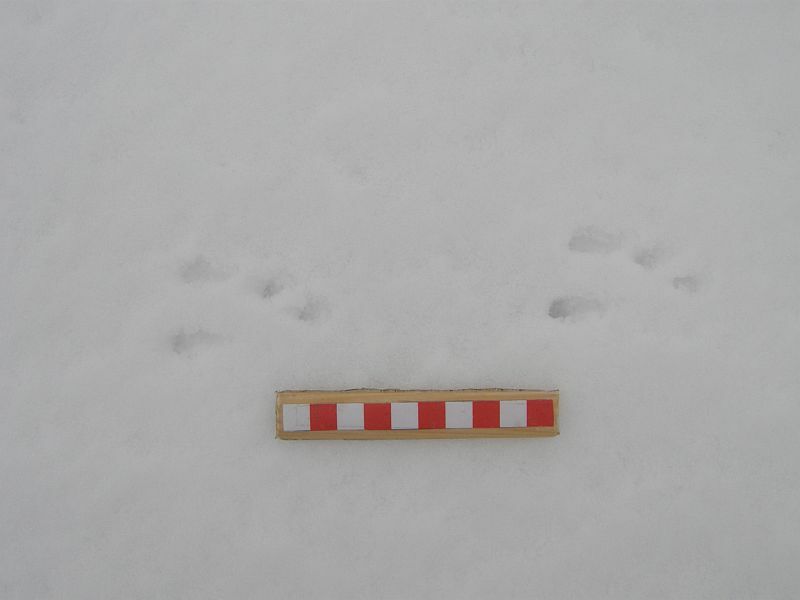 Weasel tracks are smaller with a stride of 25-30cm. The stride length of my tracks is about 20cm, so a little short, but otherwise the size and gait fits a stoat or weasel. I can’t find anything else that fits the tracks, so at the moment I’m settling for stoat or weasel as a tentative i.d. This is exciting stuff. I have a thing about stoats (and weasels). I’ve only ever seen these secretive little mustelids a few times, and any evidence that they’re at large in the area is good news for me.